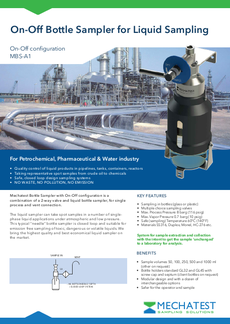 Mechatest Liquid Bottle Sampler with On-Off configuration is a combination of a 2-way valve and liquid bottle sampler, for single process and vent connection. Liquid sampler that can take spot samples in a number of single phase liquid applications under vacuum, atmospheric and low pressure. 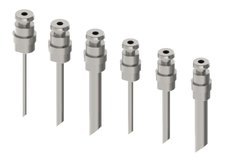 This typical “needle” bottle sampler for liquids is closed loop and suitable for emission free sampling of toxic, dangerous or volatile liquids. Modular and with a dozen of interchangeable options. Highest quality and best economical liquid sampler on the market. 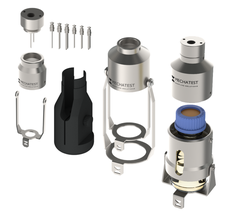 For end of line sampling to combine with bottle adapter or second bottle retaining clip to use a sample bottle and a second waste bottle. 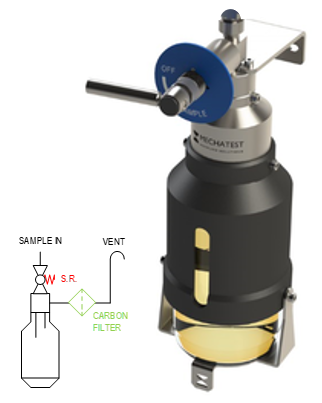 Single handle operation with an instrumentation (small volume) 2-way valve, this on-off sampler enables the collection of a liquid process sample, typical for direct mount to the process pipeline to prevent dead volume of sample. For end of line sampling, where refreshing of sample is a problem, use our bottle adapters or second bottle retaining clip to use two bottles with different volumes (a sample bottle and a second waste bottle). Easy sampling procedure, open sample valve, sample can flow into the sample bottle under system pressure, while air and gasses in the bottle are vented through the vent connection. When the required volume of approx. 80% of the bottle volume is taken, turn off the sample valve, the sampling procedure is completed. The sample bottle holder consists of a bottle adapter with a process and vent needle, the sample bottle is sealed with cap and septa. 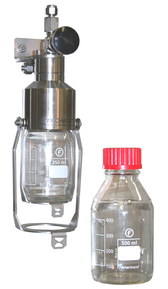 This “needle” type bottle sampler is a closed loop system and enable operators to obtain samples of liquids, hazardous or toxic. The spot sample collected in a sample bottle is more safe and easy for transportation to the lab. 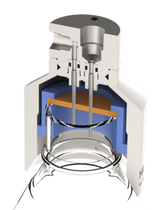 Use "spring return handle" on the sample valve to protect personnel and prevent unnecessary sample waste. The spring return handles also known as “deadmans” handles, always "spring" return to closed position when the handle will be released. Check our list of all specific International ASTM and ISO "sampling" codes & standards. . . . .